'Dan Will LLP' is a family run business, formed in 2010 and run by Mark Dreher BSc (Hons) MIMI and Joanne Dreher. Mark is a member of the Institute of the Motor Industry and working to become a fellow of the Institute of the Motor Industry. It started with the idea of having simple hire charges with no hidden extras. Having a young family ourselves we have found holiday prices are always shown 'from £200' which sounds ideal. However, when you then add on all the other additional extra's the holiday then becomes expensive. Our idea is the price you see, is the price you pay. Insurance is for any driver aged between 23 & 75 and is also included in the hire charges, so there are no additional charges for insurance cover. 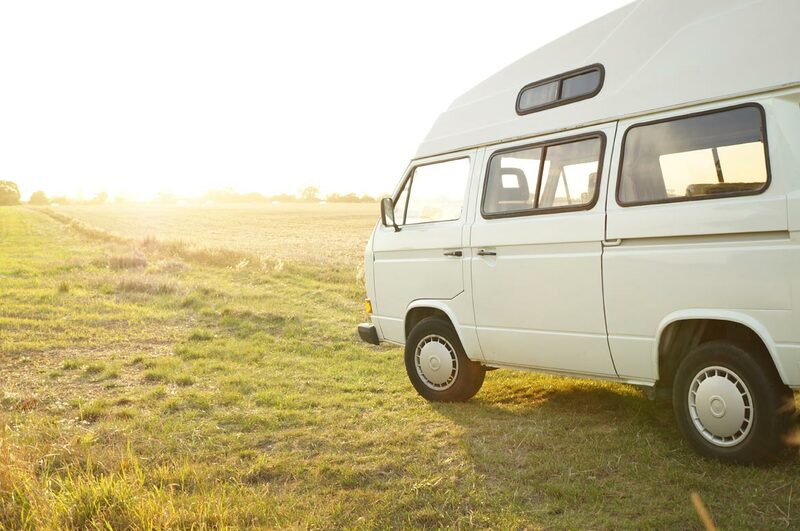 Dan Will LLP, trading as SuffolkCamperVanHire is a Limited Liability Partnership, registered in the country of England, and as such will comply with the rules and regulations of the Limited Liability Partnership as stated by Companies House. The partnership number for the company is OC360144. 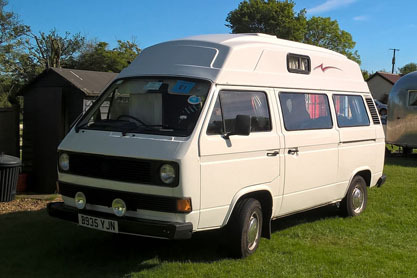 The VW T25 model line started in May 1979 and finished production in July 1992. 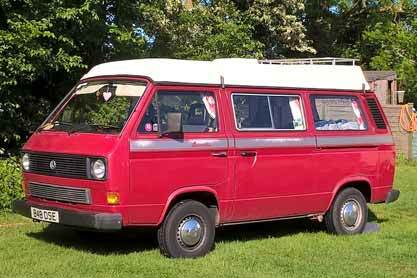 Originally these VW Camper vans were fitted with air cooled engines as per the 'classic' VW Campervans, but in 1983 were changed to water cooled engines. Better known as wasserboxer or 'water-cooled boxer' engines. All our campervans will sleep 5, however the top bunk in Cerys is ok for smaller children, whereas in Oydie, Faye & Daisy, the top bunk is sutiable for teenagers and adults as the 'pop-top' provides additional height and room allowing larger occupants in Oydie and Daisy, and Faye is slightly taller than Cerys allowing more room above. There is also an awning (included within the van hire) this attaches to the van when parked to help extend your living space. The awning also contains a built in sleeping tent making it is possible to sleep outside in the fresh air, should the mood take you. With all vans there is a 2 ring gas hob and grill and a sink with cold running water. There is also a fridge that runs from 12V when driving along, gas when parked up or 240V if you park at a site that supplies electricity. Also included in a 230V mains hookup. There are 3 pin sockets fitted withing the van, so you are able to bring some of your own items from home if required upto a maximum of 230v 500w. The lighting is 12v throughout. Also fitted is a 12v 'leisure battery' this means that you can safely use the 12v lights without risking a flat battery in the morning as there is a seperate battery to start the camper van. There are 2 gas bottles included, 1 is always full so you will not run out of gas on your trip. Also fitted to Cerys is a blown air gas heater, this will provide ample heating to the VW camper van, we have even camped in the snow! For safety there is also a smoke alarm and a CO2 alarm, as well as a fire extinguisher and fire blanket. There is also a radio/CD player with iPOD/MP3 connectivity so you can bring your own music from home. In the dash there are 12v power sockets to power sat nav's or charge up your phone whilst driving. Driving the campervan is not like driving a modern car. However by adapting your driving style this does not become an issue. We find that half the fun of the holiday is traveling to your choosen destination. There is no PAS (Power Assisted Steering) however when driving around this is not a problem, and with some practice parking becomes easy. The van is slightly longer than a standard car, but will park in a standard parking space. When driving along dual carriageways and motorways they will all sit happily all day between 55-60mph, be aware due to the high side and the softer suspension compared to a modern car that they can be caught in the wind, also when being overtaken by lorries. However after a few miles this does not become an issue. On the day of the hire we suggest you leave half an hour to sign the paperwork and to have a demonstration of the campervan. Our first VW campervan is called Cerys. She is a white 1984 VW T25 and she was converted with a sheldon hightop from new. Cerys is known as a 'semi-high top' so it is possible to stand up in the van at all times. When night time approaches and it comes time to sleep the rear seats convert into a 'rock and roll' double bed and there is also a double bed located in the top section of the van which is suitable for small children, as well as a hammock across the front seats for small children. 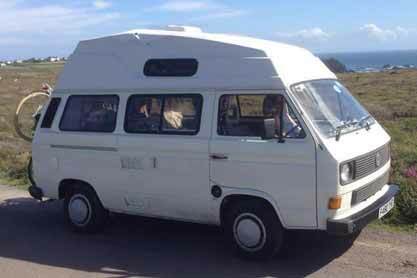 Our second campervan is called Oydie and he is a white 1990 VW T25 which was converted by Auto-sleeper from new. Oydie is known as a 'ridgid sided pop-top' which means that when driving the top is lowered making the van more like a people carrier in dimension. When parked the top can be 'popped up' to allow for standing in the van whilst also providing room for a overhead double bedding area. The rear seats also convert into a 'rock and roll' double bed, as well as a hammock over the front seats. Our third campervan is called Faye. 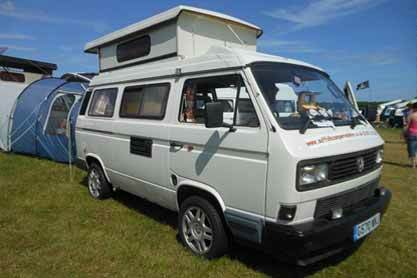 She is a white 1989 VW T25 and she was converted by Holdsworth from new. Faye is known as a 'high top' so it is possible to stand up in the van at all times. When night time approaches and it comes time to sleep the rear seats convert into a 'rock and roll' double bed and there is also a double bed located in the top section of the van, as well as a hammock over the front seats for small children. Our Fourth campervan is called Daisy. She is a Red 1984 VW T25 and she was converted by LeisureDrive from new. Daisy is also known as a 'Canvas sided pop top'. When night time approaches and it comes time to sleep the rear seats convert into a 'rock and roll' double bed and there is also a double bed located in the top section of the van thanks to the pop up roof. Hit the open road and take on the life of an explorer. Explore all of the beautiful site, sounds and smells that the UK has to offer, and don't worry about the home comforts, we have you covered in that department. 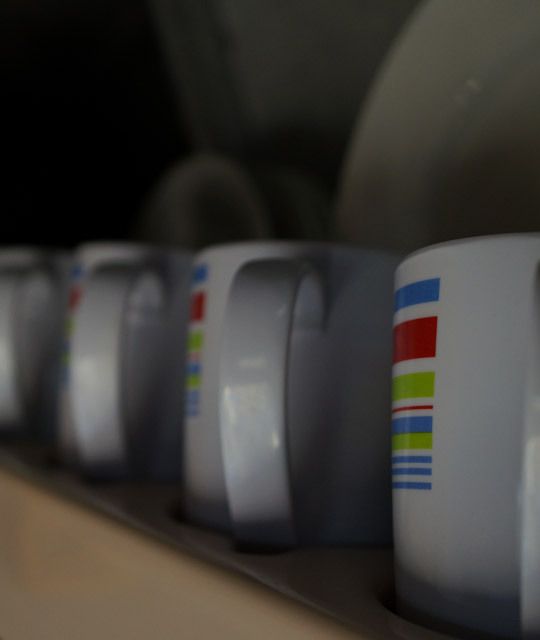 The vans are equipped with a stove and tea or coffee making facillites. Unfortunately we couldn't get a dishwasher in there but there is a sink to wash up in. Obviously being out on the open road might mean that you could explore some of the stunning cuisine cooked in any number of resturants around the country. 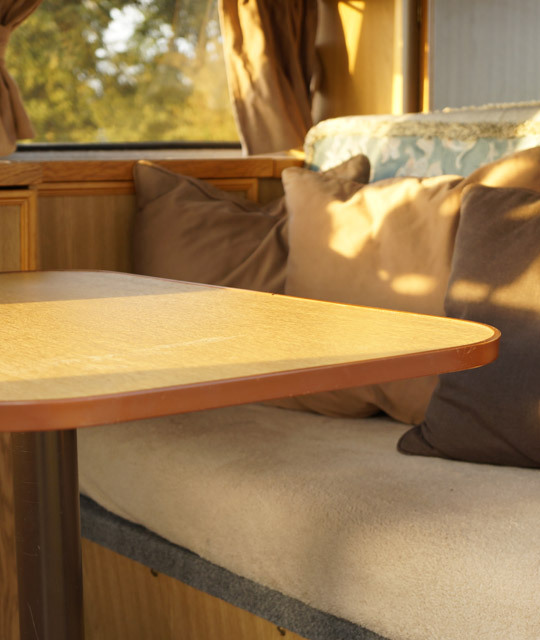 But if you did wish to eat in, then there is a constructable table inside our camper vans. Just make sure you sit straight and don't put your elbows on the table. When you hire a van with Suffolk Camper Van Hire, you don't have to leave the exploring to just the main roads. We have a bike rack which attaches to our vans allowing you to take your own bikes and explore bike trials around the UK. 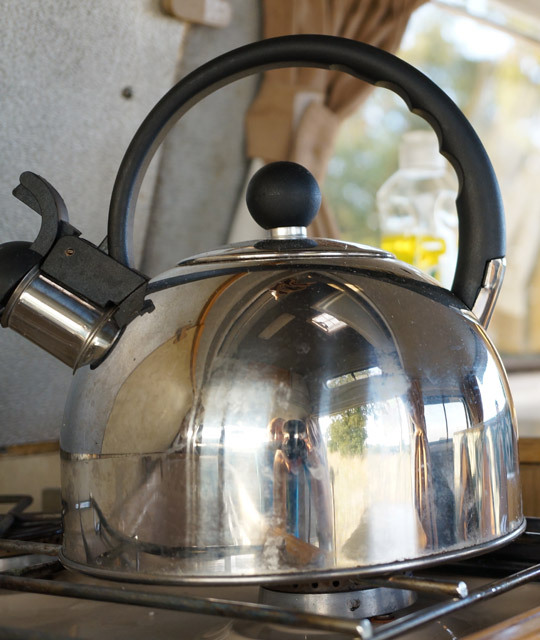 Plus as part of the Camping and Caravanning Club’s Privilege Scheme you have access to over 110 participating campsites, at discounted rates, throughout the duration of your hire period.